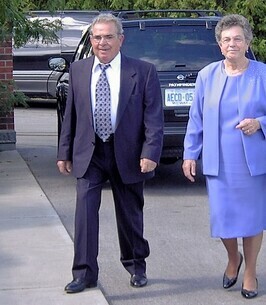 Fortunato Molica-Lazzaro Service Details - Whitby, Ontario | Barnes Memorial Funeral Home Ltd.
MOLICA-LAZZARO, Fortunato (Fred), Peacefully passed away on Monday, November 12, 2018 with his family by his side at the age of 91 years. 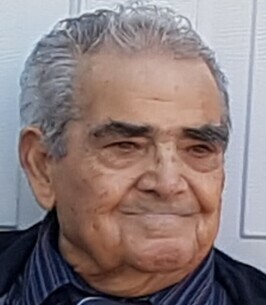 Beloved husband of Luciana (Lucy) for 65 years. Loving father of John (Kathy), Angela (John), and Tino (Jackie). Devoted grandfather of Chris (Sarah), Ashley (Cory), Samantha, Anthony (Megan), Clinton (Amanda), and Megan. Adoring great-grandfather of Abigail, Daniel, Neil, Lawson, Maverick, Nicholas, Georgia and Layla. Cherished brother of Domenic (Bessie) and Felicia, and sister-in-law, Clementina. Predeceased by his parents and brothers (Frank and Joe) and sister (Nancy). Sadly missed by his nieces, nephews, extended family and friends. Fortunato was born on April 9, 1927 in Sicily, where he became a Carabinieri Police Officer, married Luciana in Milan on September 22, 1953, and immigrated to Canada shortly thereafter. Fortunato and Luciana settled on a farm on the outskirts of Brooklin. He was an active and supportive member of St. Leo The Great Catholic Church and Knights of Columbus in Brooklin. Visitation and celebration of life will be held at Barnes Memorial Funeral Home, 5295 Thickson Rd N. Whitby on Wednesday, November 21st from 2:00 – 4:00 pm and 6:00 – 8:00 p.m.
Funeral Mass will be held at St. Leo The Great Catholic Church, 130 Watford Street in Brooklin on Thursday November 22nd at 10-:30 a.m. followed by entombment at Resurrection Catholic Cemetery, 355 Taunton Road East in Whitby. In lieu of flowers, donations to the Heart and Stroke Foundation or a charity of your choice. We encourage you to share any memorable photos or stories about Fortunato. All tributes placed on and purchased through this memorial website will remain on in perpetuity for future generations. Our deepest condolences. Our thoughts and prayers are with you in this difficult time. Our deepest condolences to the family, our thoughts and prayers are with you. With our heartfelt sympathies. May Fred (Mr. Molica) rest in peace in God's care. May God watch over and bless your family in this time of sorrow. Maria Frendo-Cumbo and Family. Our deepest condolences to Lucy and family. Fred was a wonderful man, we always enjoyed his company and we will miss his smiling and welcoming face.